Located in the city center Al - Saada Street ( Hotel's Area ), 50 Meters from Aqaba shopping center and 50 meters from Hotel Beach. 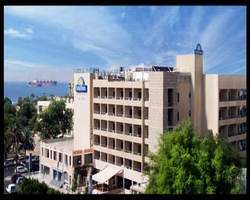 A total of 110 rooms and suites within 5 floors, 10 Suites, 100 Rooms, Connecting Rooms Available, Most Rooms overlook the Bay of the Red Sea, all the way to Eilat City in Eilat City in Israel. - Marvelous Night View. The Hotel features a restaurant where all guests can have their meals. There is a swimming pool on the roof top with a snack, the entire roof is decorated and made to be like a cruise ship deck which gives the guests a feeling of sea freedom, marvelous open restaurant with a bat view. During the day time the entire rooftop is used for guests to sit and relax to have a snack and enjoy the sun where they can order meals and drinks from our tropical snack bar. Sun Chairs are also available on Roof Top.